In the first verse, John was referring to the Gnostics who believed that all people are born good. He’s explaining that all people are born sinful, and that those who say otherwise don’t have the truth. My family recently heard a pastor use this verse to explain that Christians can’t quit sinning, and Will was impressed with the fact that even some of the little boys knew the scriptures well enough to be able to counter that argument. Notice the second verse uses the words "have sinned" (past tense), not "continue to sin." That’s what it means to be a true believer. Not just believing that Christ is the son of God (for even the demons know that), but believing that he died to take away our sins. Only by faith in that promise are we truly saved. 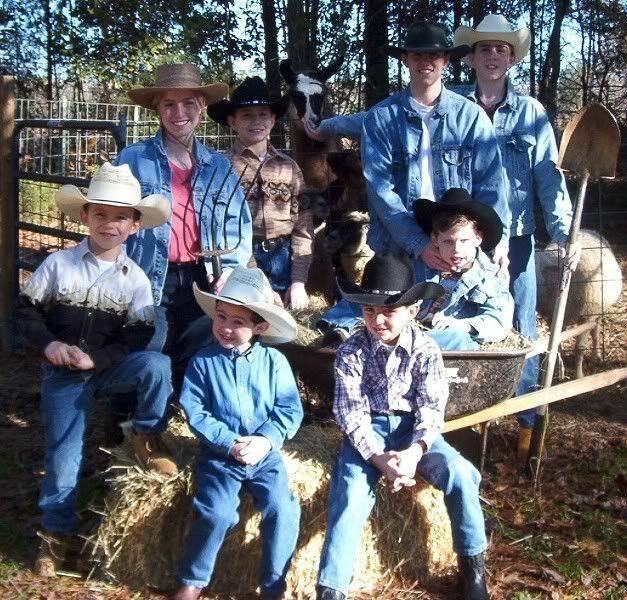 My family has been putting videos up on www.milkandhoneyacres.com and maybe you would like to see them. If they aren't on the first page still, click "videos" on the sidebar. But first I should tell you that I'm sorry I frustrated Sarah Grace and she got angry with me. I'm kinda nosy and curious and I distracted them. I'm so sorry everybody and especially Sarah Grace. All of a sudden Sarah Grace has started writing online and she made a friend in the UK. He tried to do a Southern accent in a video entry and we all laughed so hard. Even Dad thought it was very funny. Mom and Sarah are studying dialects now and it is quite interesting. There are many different Southern accents even in our own state. Our accent is much different than a Charleston or "Low Country" accent. Their accent has an African sound from the Gullah or Geechee languages of very black people who live on the islands around South Carolina and Georgia. I saw two of these ladies sitting on the steps by the columns of a building in Charleston making sea grass baskets. They are extremely black. Many of those ladies were mammies to white children so the white children got that sound. It is a beautiful accent, warm and smooth as butter. Mrs. Sarah, my British friend, looked up Publix to see the cakes I was talking about. We had the Chocolate Ganache Supreme and the Strawberry and Peach Sensation. She said she's lucky they don't have those for such a good price at her home because she would eat them all the time! We had cantaloupe from our garden this morning. We were late planting them so they are just now ripening. They were quite tasty. Everything seems better when you grow it yourself, I think. Dad's been taking us to the pool a lot and we met two men and they played volleyball with us and we wished Sarah had come and met them too. We want Sarah Grace's husband to like all of us a lot, and these men did. These men were a good bit older than Sarah but that's okay because what matters is that her husband loves her for his whole lifetime. I can't imagine how I would feel if someone hurt her. I bet I would want to beat him with an iron rod, and I'm not ashamed to tell you that. I read an article in The Economist about the trouble dairy farmers are having. One poor guy is trying so hard to keep his farm going. His father and grandfather were dairy farmers. I would love for us to be dairy farmers and the article made me sad to know how hard it is for these people. I also read another article in the same magazine about farmers in Britain. They are into the "agritainment" business to make money. We actually thought about something like that. I got interested in the Britain section because of Mrs. Sarah and Mr. Billy. If I seem a bit impatient with John, you should know it's because he kept popping in repeatedly during our practice session. We even saw him perched on top of the outside rail, peering in the sliding glass door... just don't judge me for my seemingly hostile outburst. We're planning on celebrating Will's birthday soon and I'm giving him a bottle of cologne. I've wanted to get him cologne for a while now, so I can't wait until my mom and I go to the mall to sample the different ones out there. I'm not very familiar with what's "in" with men's cologne, but I feel confident that I'll pick the best one for Will's personality. I've finally decided on the model harp I want, and we're ordering it today! I am so excited, you have no idea. The harp is a 36 string Siberian figured elm Sonata. It has the most gorgeous tone of all the harps I heard on the website, and a very interesting wood grain design. They said it should ship within 2-3 weeks. Yay me! I had a dream where I was helping Absalom brush his hair in our kitchen... and then we fell in love. What could that mean? Here I am being a good sport doing a screen test for my brothers, the movie makers. I used the style of makeup that was worn in silent era films. The darker shade of eyeshadow is swept across the eyelid just below the crease and up into the inner corner right under the start of the eyebrow. This creates an innocent look as opposed to the sexier style that is used today, with the dark shadow in the crease toward the outside of the eye- like a cat. Please forgive the messy classroom, we were cleaning off the shelves... my mother made me say that. I haven't written in awhile because my grandfather died. I don't have much to say about him because I didn't know him very well, but I wanted to. The good news is that I got to meet two of my aunts, an uncle, and some cousins. I've wanted to meet them my whole life. I really hit it off with my 26 year old cousin. He thinks I'm a good writer and he is a playwright. He came to my journal before. He said something to me that I didn't understand so I just laughed. Everything went through my mind like light speed but all I did was laugh. I was on the spot. When we said goodbye, we shook hands and hugged at the same time. My uncle was just as nice to me, he said little friendly spurts of nice things. After the funeral we went to Ma's house and I was hoping they would come too, but they couldn't. We saw lots of Ma's friends and our little boys did a good job of being magnanimous. We aren't allowed to be shy or aloof because that is bad manners. We are to shake everybody's hand and hug anyone who will let us. The whole weekend was spent meeting and greeting people and there was lots of food with beautiful desserts. We had one chocolate cake that looked like a fancy bakery baked it but it was from Publix, of all places. On the 4th of July, Sarah Grace and Dad took us to the Peach Festival that night to eat peach ice cream and watch the firework show. Mom stayed at home because she was tired from grieving and she was glad to be alone. She usually always wants to be with us, and I felt bad that she wasn't, but we all understood.